Converts bare end coaxial cable. 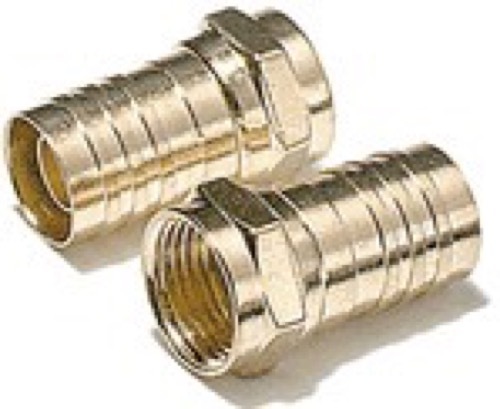 Allows RG6U cable to be connected to TV's VCR's, etc. Gold plated for improved performance. Satellite Compatible. Comes 2 in a package. Studio grade for optimum performance with digital and analog devices. Tools needed: wire crimping tool, cutter. Strip the insulation and shielding to expose 3/8" of center conductor. Strip off 1/8" of the outer jacket and shield. Push connector on to cable end and crimp ferrule securely. It will take two crimps.